Can you name all of these controllers on this retro gaming poster? 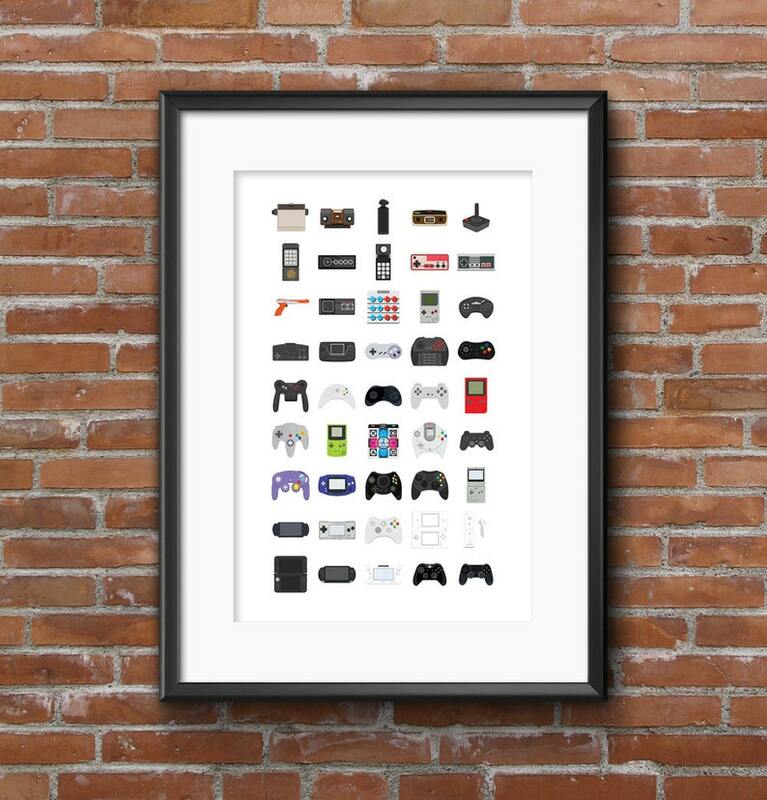 If you're a videogame fan, surely this videogame controllers poster will give you some warm fuzzies. 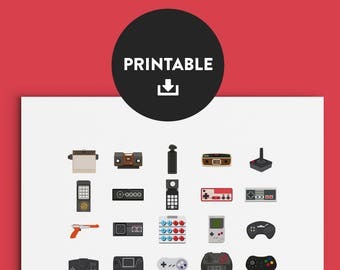 This print has 45 illustrated video game controllers on it, some a bit more obscure than others. You'll see all of your favorites in here, like the original NES and Super Nintendo, the Sega Genesis and the original Playstation. You're also bound to see some in here that you have never heard of, like the Fairchild Channel F, the Vectrex, or the Apple Pippin. This poster is a great conversation piece, and is a fun game to try to figure out what all these controllers are! Shipping: I'll get this in the mail within 3 business days. Want to keep up with new illustrations I'm working on? The print and the paper quality is not as good as I would have liked. It showed some wrinkling around the edge even in the frame. Seller reached out to me immediately and offered to send another print at no charge. Very good customer service. Cool poster. My boyfriend will love it for his game room/ man cave. In my opinion, it is a little pricy for what it is. I am not discrediting the work that it took to make it; I just feel for the paper quality (poster paper), and the fact that it is not framed already, it’s pricy. I'll take most forms of currency. If you'd like to send a check, the payment must clear before product will be delivered. Posters ship in <a href="http://www.erdie.com/c/shipping-mailing-tubes/tri-hex-mailing-shipping-tubes>Erdie Tri-Hex Shipping & Mailing Tubes</a> via USPS. Depending on the stock of a specific item, I cannot always offer an immediate replacement product. If that is the case, I will happily refund the product, and will notify you once it has been made available again.